In other situations, poor stands result from poor soil preparation, improper seeding depth, or bad timing of planting (nearly ALWAYS critical to plant in early fall periods in CA - and this doesn't mean November). All of these will be important in evaluating whether it's a better idea to overseed alfalfa to bolster the stand, to overseed with another forage, to till it up and start over, or to rotate to anther crop and then come back later. Overseeding Alfalfa to bolster the stand. If a new stand falls below about 10-20 plants/ft2, it's a good candidate for overseeding with additional alfalfa. January to March is the ideal window for seeding alfalfa into alfalfa to bolster the stand, which unfortunately now is rapidly closing. These longer days promote seedling growth, there's less competition from summer weeds, and winter weeds are phasing out. For seeding, probably using a shallow-seeded (controlled depth) grain drill would be a first choice (no till). Broadcasting seed and rolling it would be a second choice, since seeding depth isn't as consistent and more seed may be needed. Very light tillage (e.g. 1" scratch) may help in developing a somewhat acceptable seedbed. Autotoxicity? In young stands, we don't worry about autotoxicity much (chemical residues from existing plants that prevent germination of seedlings)– the more important issues are competition from existing plants (where they exist) and keeping moisture in the top inch to encourage seeds to germinate. Thus, sprinklers may be needed, when rains are unreliable. Flood irrigating seedlings up is a technique that requires skill and luck but works on level, well drained checks. The key is to not allow standing water beyond 6-8 hrs. Seedling diseases from saturated conditions are more problematic when flooding fields in warmer temperatures and poor drainage soils. What about Weeds? Weed germination will be important to deal with for late winter plantings. If you have a Roundup Ready stand that needs help, that's a good thing because this allows more flexibility in weed control. When you have a mixed stand of established plants and seedlings, restrictions with conventional herbicides are a factor, depending on the age of the stand (new versus older). 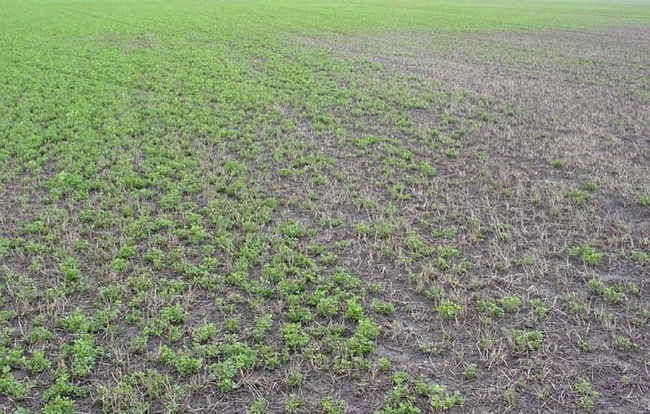 In addition, some conventional herbicides have plant back restrictions that might prohibit seeding alfalfa or other forages in the stand (important to check the label). For costs, keep in mind that typically the Roundup Ready technology fee (about $3/lb seed) is waived on a re-plant situation for Roundup Ready fields, so that makes it cheaper to overseed. You can overseed Roundup Ready alfalfa seed into a conventional variety, but of course the conventional variety will be sprayed out and those plants lost. Seeding other Crops. Cool-season grasses can be overseeded in weak alfalfa stands, but only in the fall. We have had some very bad experiences with spring-planted grasses – they germinate fine but just sit there, and weeds become a big issue. Grasses also change the market of the hay, though mixed alfalfa grass hay is in demand for the horse hay market. Established stands are different. Overseeding is generally recommended in the last years of production as a way to increase yields before the field is taken out, as discussed in Leinfelder-Mile's article Overseeding Older Alfalfa. But again, know your market for the hay because mixed hays are lower quality than pure alfalfa that's destined for dairy markets. 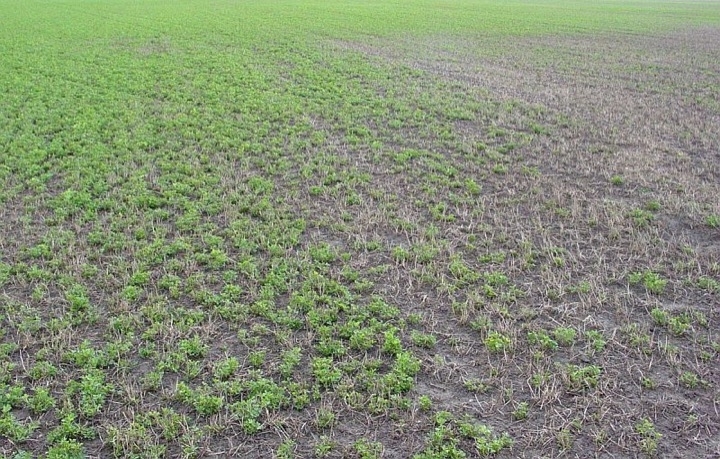 A warm-season grass (such as tef or sudangrass) might be sown in late spring in seedling fields for summer harvests, but that changes the product considerably and you are likely to lose your alfalfa to competition. Evaluate Risk. All decisions entail risk. If the timing for alfalfa overseeding is off, another option is to plant a summer annual (e.g. corn, sudan, tef) and try again in the fall (early fall!!!!). An early fall planting that is irrigated up goes into the winter season with good growth and vigor and withstands frost, diseases, and weeds much better. Early plantings have proved tried and true for the highest likelihood of getting a good alfalfa stand and higher yields the first season. Over many years, this practice (early fall planting) has stood the test of time. In the intermountain area, this is primarily in August, whereas Sacramento, September makes more sense, and October is realistic in the southern San Joaquin Valley and CA Deserts. Later than these dates are much more risky. Remember Seedbed Prep. Additional practices to ensure a productive stand include preparing a good seed bed that is well leveled so there are no high or low spots where it's dry or water pools. Select seed that is well adapted to your growing area that has high levels of needed pest and disease resistance. Use certified seed that's usually treated for seedling diseases and inoculant for nitrogen fixation. Good nutrient management is also critical. For example, ensuring adequate molybdenum in the soil is essential for nitrogen fixation. It PAY$ to pay attention to these critical details up front to make sure that you have a productive stand that produces high quality hay for years.